This handheld PDA from HP is designed for moving data between the enterprise and the mobile field worker. 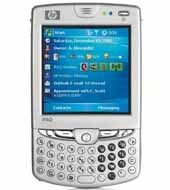 It is due out in the summer and combines many of the features that previously were only available in a Blackberry unit from RIM. The advantage of the HW6940 over a Blackberry is the ability to hold large amounts of enterprise data, and full functional relational database applications on them. MobileDataforce is excited to begin delivering solutions on this device. HP sees the future - and the future in convergent PDA Phones. I never thought of a manhole cover in terms of their intelligence? Another cool application for RFIDs and handheld PDAs. I read this article and can think of many uses for enterprise quality encrypted instant messaging on Pocket PC phones. The ability to IM a field worker to inform them to synchronize their mobile application is a very good example - "Charlie - you have a new work order!" Charlie pushes the synchronize button on his PDA and downloads the new work order. Another example - "Charlie, click here for a map to your next job"
My consulting team received this new XV6700 Pocket PC Phone this week from a customer. Our customer (in home healthcare) selected it to run our PointSync software on. They are using our PointSync software and a customized application we developed to monitor, remotely, the health condition and medicine that their 500 patients are using. 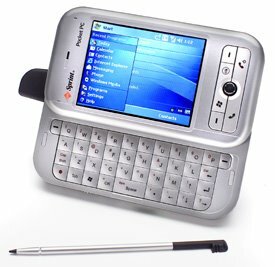 The bottom-line, my team loves this Pocket PC phone. It slides shut into a very comfortable phone, and the keyboard is very usable. The landscape screen gives you very readable emails and other data. This particular phone is sold by both Sprint and Verizon. MobileDataforce is being engaged on more and more of these home healthcare related projects. Form 1 has a question with 3 possible answers (a,b,c). If you answer the question with "a", the electronic form on the PDA jumps you to another page to answer additional questions related to answer "a". The form is now customized to ask only questions related to your previous answers. If a question asked for a unit of measurement in meters, and you answer with a "yes", it can pop-up a message saying - "Invalid answer please use numeric answers"
The opportunities to creatively build work flows and business processes into electronic data collection forms on handheld PDAs are powerful and endless. The immediate values are improved quality assurance, process standardization, better data, controlled processes and normalized procedures. We have recently provided a mobile software solution to a large highway/roadway construction company in Ireland to address their need to document safety inspections on scaffolds and cranes. 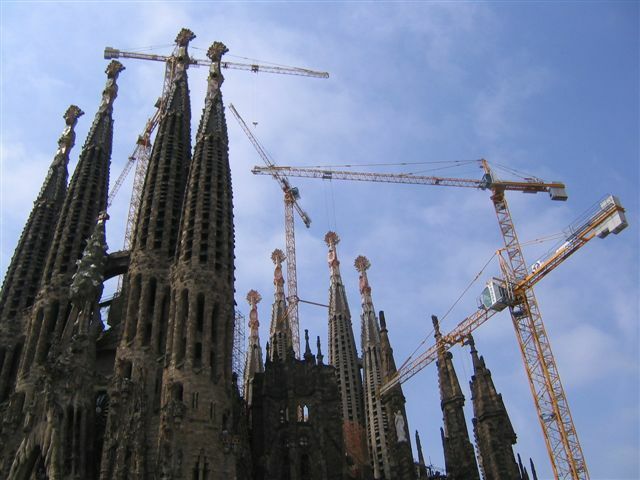 Ireland has safety regulations that require each work shift to inspect the scaffolds and cranes before using them. The purpose of these regulations are to avoid accidents like this recent one on Boston. For those not geographically challenged - yes I took this photo in Spain, not Ireland, but it looks good and matches this topic so no complaints. This customer has the requirement to document and store all safety inspections in case they are audited or there is an accident. 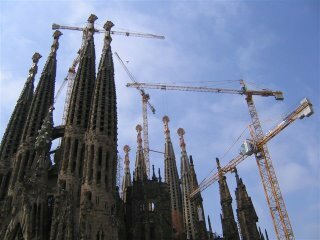 Since many of their construction projects have 2 work shifts per day, this can mean up to 10 safety inspections per job site per week. 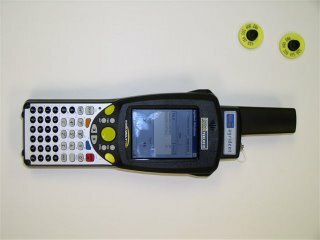 In order to keep all of these inspection forms organized and stored, they required the use of handheld computers on each job site that would synchronize the data from each safety inspection with a centrally managed database at their headquarters. 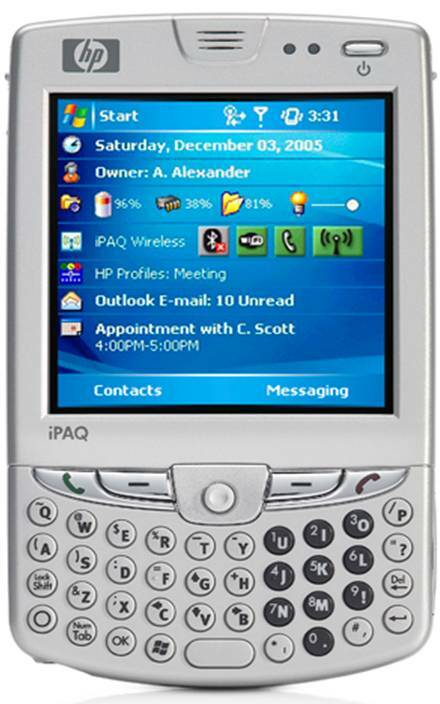 The handheld PDAs were low cost iPAQ Pocket PCs from HP connected to a SQL database. The PDA version of the safety inspection forms were created using MobileDataforce's Intercue Mobility Suite. 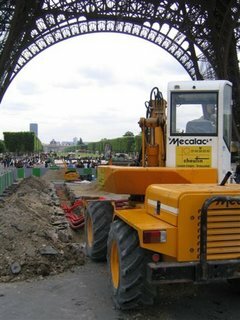 A few months back we created a mobile work order management system for an "underground cable laying" business. I did not even realize this was an "industry" category, but soon learned it even has its own annual conference in Las Vegas. Our customer works on behalf of utilities and phone companies to lay cable primarily along roadways. 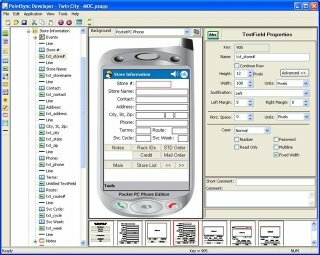 Our solution was delivered using Pocket PC handhelds, MobileDataforce's Intercue Mobility Suite software, and uploading to an MS-Access database application. Recently this same customer has been pondering an upgrade to our PointSync solution which would allow for bi-directional database synchronization and a full RDBMS on his handhelds. A friend of mine works at a company that supplies temporary and contract labor. 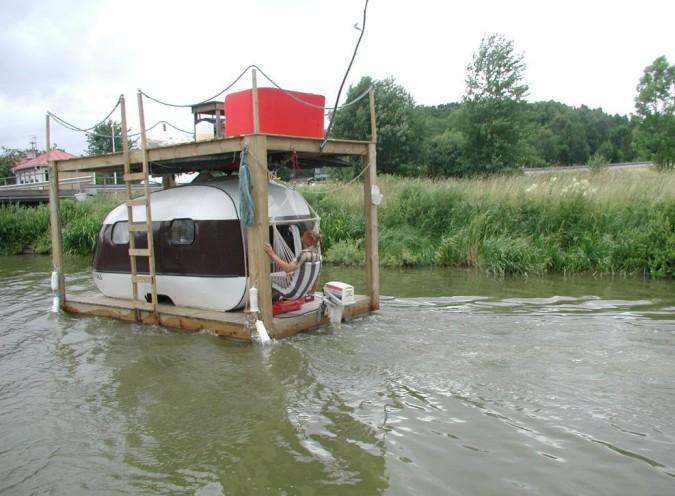 They recently supplied an electrical utility with a dozen workers to act as data collectors. 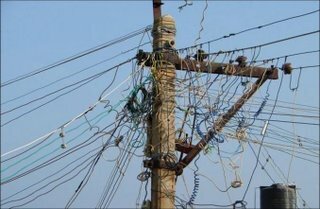 They were given the task of counting the number of lines coming off of each electrical transformer. 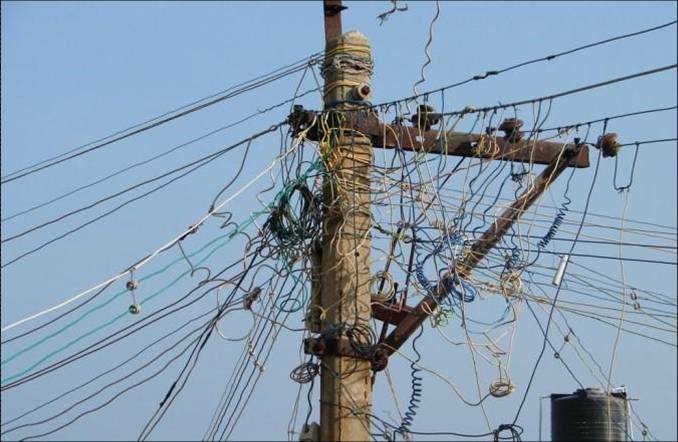 They were suppose to walk to the transformer, count the lines connected to it, and identify where each of the lines terminated. Despite my valiant sales effort to convince them to use our PDA based data collection solutions, they decided to accomplish this task using paper forms on clipboards (my arch rival). The other day I met up with my friend and he shared that the project had been a disaster. Why? Large amounts of the required data collection fields were left blank, or were unreadable. Random testing of the data uncovered a great deal of inaccuracies. To add to these issues, the mistakes and problems were not discovered until the project was completed and the workers dismissed. Bad data in - bad data out. To send a group of temporary and unproven data collection people into the field with paper forms is expensive, time consuming and often a total failure. By automating the data collection process, and engaging in real-time quality assurance, you can ensure you are getting accurate data and the results you require. Inspection services is a very popular category for MobileDataforce. We have hundreds of end users who are using our mobile software solutions to do facilities inspections, asset management inspections, quality assurance inspections, pharmacy inspections, animal inspections and more. The process of inspecting an asset is quite similar across many verticals. An electronic inspection form on a handheld PDA needs to be created. The questions and data need to be customized to fit the exact requirements of the process. The data needs to be validated to ensure quality data is gathered, and a method for synchronizing and integrating with a back-office database needs to be configured. Both of our mobile software suites can accomplish this, Intercue Mobility Suite and PointSync. The Intercue Mobility Suite saves the data gathered on the PDA as an XML file, and MobileDataforce's PointSync saves the data to a RDBMS on the handheld PDA that is configured to integrate with a back-office RDBMS. This week one of my professional services teams (mobility gurus) are working on a very interesting mobile application for testing Hybrid cars. This application involves a handheld PDA using Windows Mobile connected to the automobile's diagnostics using a plugged in RS232 adapter. All cars manufactured after 1995 have this plug-in. This adapter is connected to an inline device that interprets the codes coming from the engine and feeds them to the handheld PDA. Once the data is fed to the PDA, our mobile software application, Intercue Mobility Suite, displays the data in an electronic form where additional human gathered data can be added. Once the data is gathered it can be uploaded directly to a database or spreadsheet for analysis. 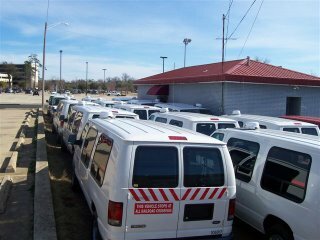 We seem to be working on a lot of vehicle inspections, analysis and other automotive solutions lately. This announcement may enable handheld Win CE or Windows Mobile devices to have up to 32 gigabytes of storage on each device. Anyone want to load SAP or Oracle on their Pocket PC? This is a fun and challenging solution since it involves synchronizing over both GPRS and Satellite depending on the availability of the GPRS networks. This solution uses our PointSync software, and Psion Teklogix handheld computers mounted on the dashboard, and a Satellite/GPRS dome from Wireless Matrix. 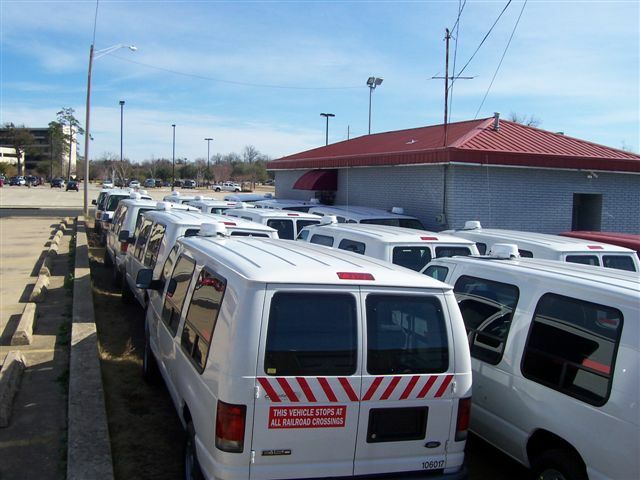 The architecture involves a database driven dispatch system in Canada, that communicates via GPRS or a satellite uplink with the van based handheld computers in the USA using a Win CE mobile software solution for fleet management from MobileDataforce. The other day I put on my farm clothes, and headed off to a calf raising farm. Why? I wanted to see handheld computers in action. Farming is not done the same way as it was when I was a young dairyman. Now days as a result of "Mad Cow and Hoof-and-Mouth" diseases large buyers of meat (grocery stores, Japan, Europe many more...) want a meat seller to be able to track exactly where a steak originated, and they want it in 48 hours. Just last week a cow in Alabama was found to have Mad Cow, and officials were not able to track the cow's origins beyond the auction yard. This is a big problem. There may be other exposed cows, but no one can tell. So healthy cows and clean farms all fall under suspicion. This becomes not just farmer's problem, but an industry's. We are very involved in developing solutions for the cattle industry here at MobileDataforce. Our software enables a handheld computer with attached RFID readers to immediately and uniquely identify a calf with an RFID ear tag. So any movement of the calf from one pen to another, or from one farm to another can easily be tracked by reading the passing ear tags as the animals are moved or loaded onto a truck. In addition, any health issues that the calf experiences as it grows can be identified by reading the RFID ear tag, and identifying the health problem and any treatments associated with that animal. This information stays with the calf through life and death. So in effect - this solution is a "chain-of-custody" for animals. It tracks their movement, any associated farms, health issues and other animals that they have been in contact with them and the data is stored for "track-back" in the event of a disease outbreak. This is a very interesting application of mobility. It is also an application with global health significance. My definition of a RAD tool is a Rapid Application Development application that allows a user to rapidly create mobile applications. What is the significance of a RAD tool? It is absolutely required if you are trying to quickly build a mobile business application. No one wants to spend months or years of expensive time and energy developing synchronization features. No one wants to spend months or years figuring out how to integrate mobile applications with backend databases. No one wants to spend months developing connectivity with Satellites, GPRS, integration with RFID, Bar code, GPS, Digital cameras, etc. No one that is, except a few crazy mobility gurus and developers here at MobileDataforce. We have spent over 24 man years designing and developing a RAD tool for mobile applications called PointSync. The purpose of this application is to do all the boring, time consuming work on your behalf, so you can spend your time configuring mobile applications to give you the best "return on investment". Our customers often say that over 80% of their mobile application requirements are already available in the RAD tool, PointSync. 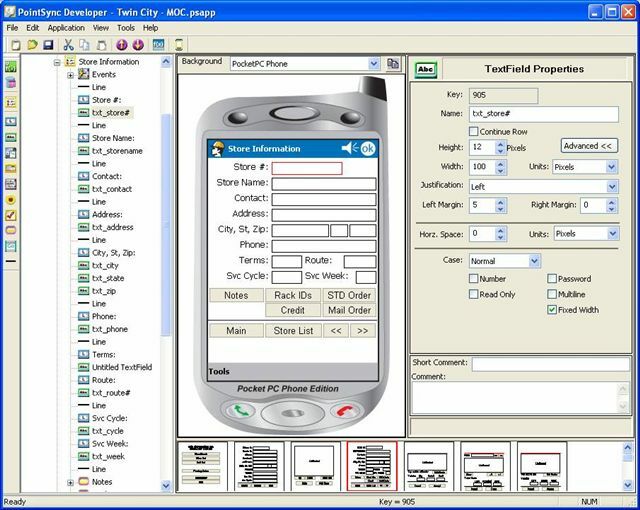 These users can reserve their time for configuring their mobile business processes, not optimizing C++ code for use on a large variety of different mobile handheld computers.